The Balt wide body flat panel tv cart with cabinet is designed purely for users’ convenience and smooth workflow. 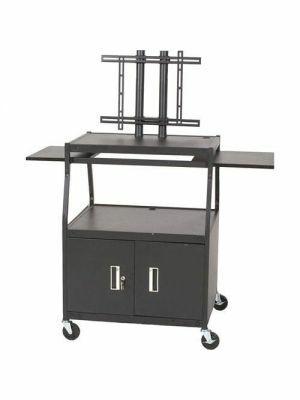 This robust flat panel tv cart comes with black powder-coated steel frame, making it a rust-free and easy to clean tv cart. The 27531M wide body flat panel tv cart supports VESA mounting system with the display size ranges from 30” to 50” and can hold maximum weight of up to 100 lbs. There are four casters for smooth and easy mobility within the premises and 2 locking brakes for stationary position. 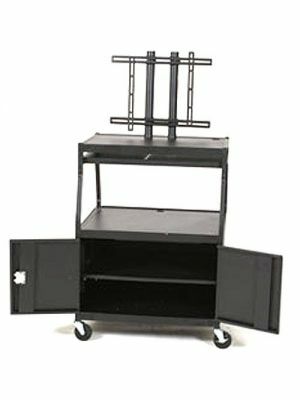 The 27531M wide body flat panel tv cart offers three shelves that can be used for optional accessories or devices. It supports cord management system that reduces cable clutter by providing a proper space for cables inside the conduits. Nonetheless, the 27531M wide body flat panel tv cart has achieved GREENGAURD GOLD and UL/CSA certification. Q. Does the Balt wide body flat panel cart (Black) come with warranty? Q. Does the Balt wide body flat wide body panel cart (Black) hold displays more than its weighing capacity? A. Yes, the Balt wide body flat panel cart (Black) can hold displays more than its capacity, however it is always recommended to use the carts of required capacity. Our store offers carts that accommodate all kinds of displays. Q. Where can I use the Balt wide bodyflat panel cart (Black)? A. 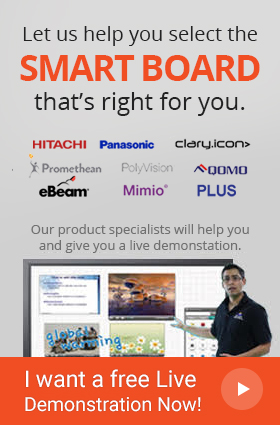 The Balt wide body flat panel cart (Black) is ideal for every kind of industry such as business environments for presentations and seminars and class room environments for lectures and collaborative discussions. Q. How can I clean the Balt wide body flat panel cart (Black)? In order to clean the Balt wide body flat panel cart (Black) , use the wet and soft sponge and lightly rub over loose dirt.